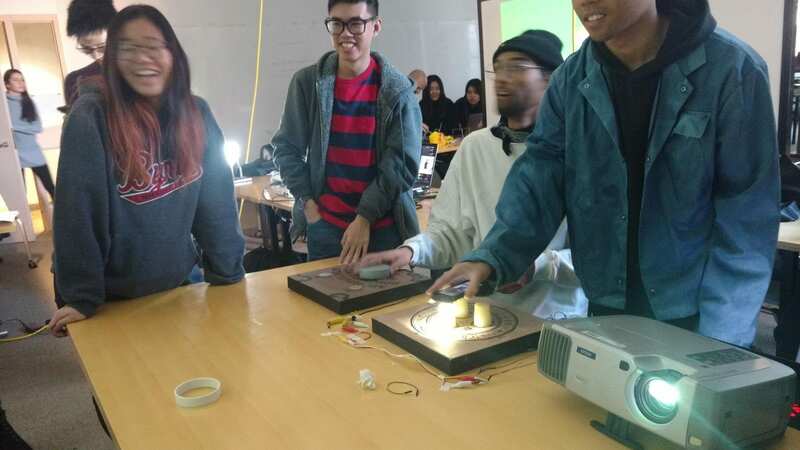 For our final project we wanted to create a twist on the traditional two player competitive arcade game by altering how the players would typically interact with the game. 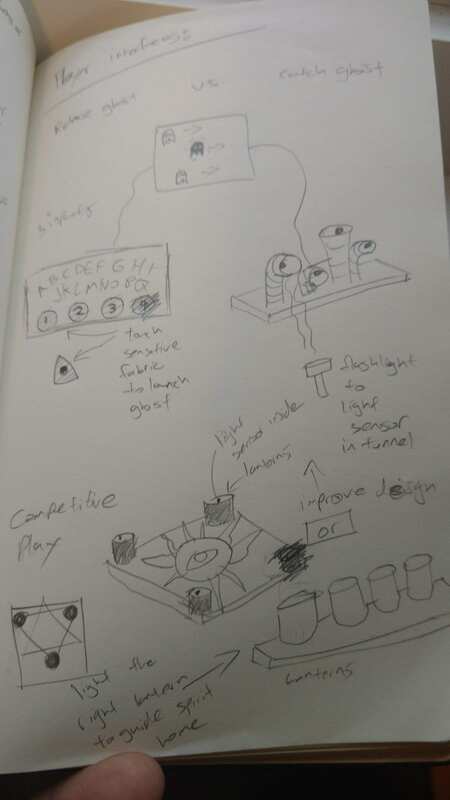 Our game mechanic was centered on a goal keeper and a striker wherein player one summons and unleashes ghosts along three lanes by using touch sensitive fabric on an Ouija board, the other player would then banish the summoned ghosts by using a flashlight to light up light sensors within a candle in order to launch a beam of light along a corresponding lane. The overall theme of the game was inspired by “Luigi’s Mansion” wherein the player uses a flashlight to combat ghosts within a haunted setting. 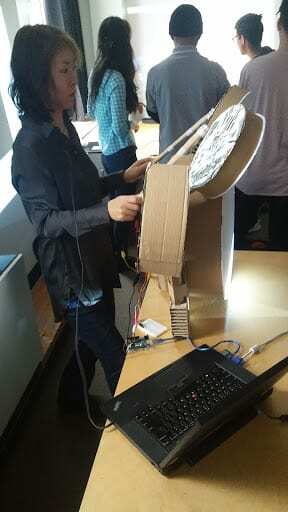 The inspiration for our project was based around implementing non conventional human interface devices to interact with a seemingly classical arcade game. Our original concept was to recreate an existing arcade game within P5.JS and use a variety of sensors to interact with the game in the place of traditional controllers. 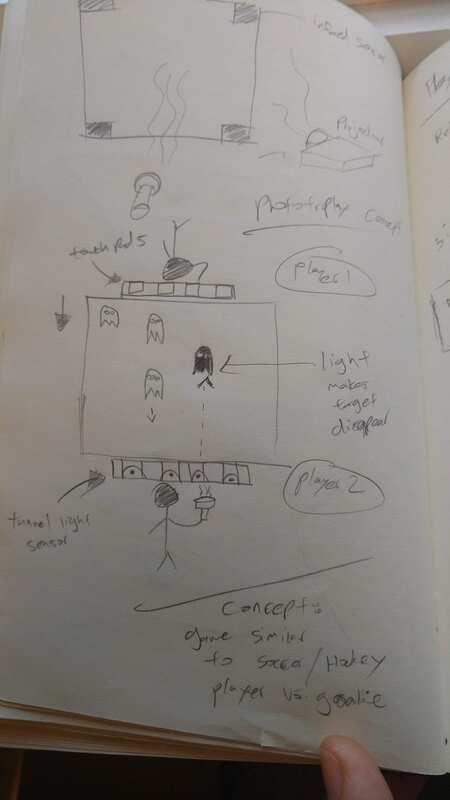 This concept evolved to focus on two player competitive play wherein games such as air hockey or Pong were taken into consideration for game mechanics. 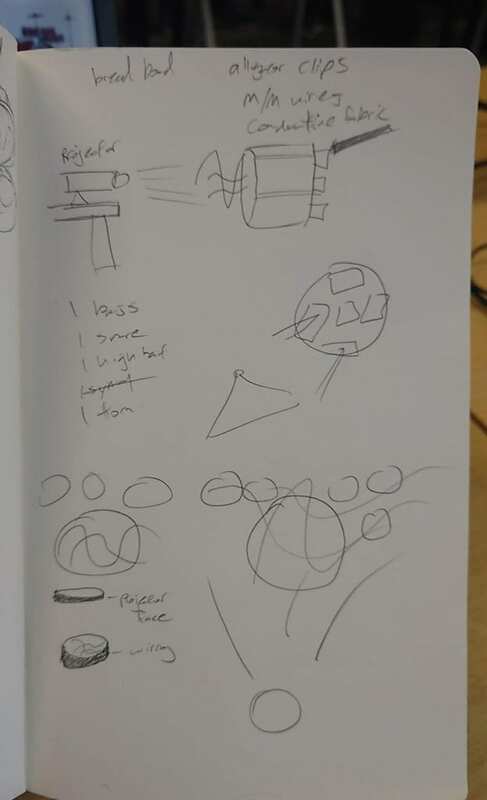 When discussing how the player would interact with the game we decided that using light as a controller would be a novel, creative, and unique idea where the inputs would be based around light sensors. 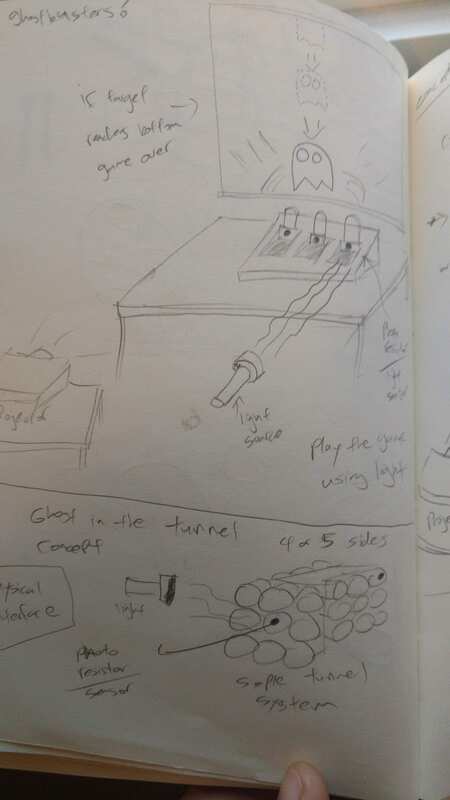 We then related this idea back to our original inspiration of “Luigi’s Mansion” where the character utilized light in order to fight ghosts; the game’s theme revolved around summoning and banishing ghosts which suited the theme of our arcade game and allowed us to develop two unique purpose driven controllers. 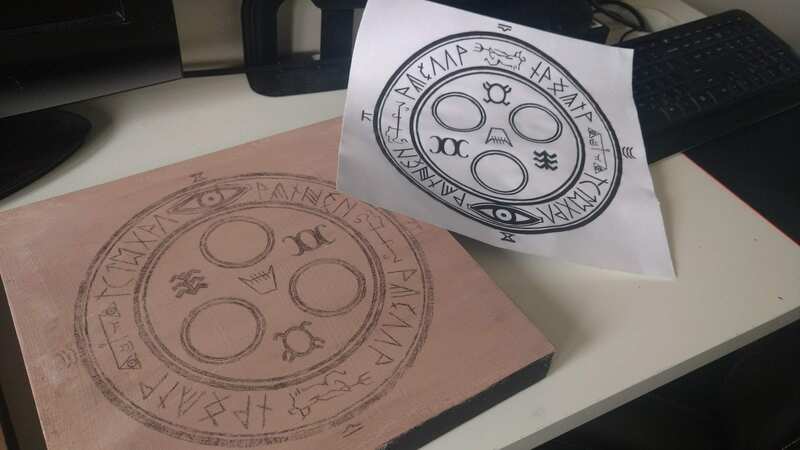 For the design of our controllers our goal was to create a unique and creative design that relates to the overall theme of the game as opposed to simple buttons and switches; after experimentation with what materials and parts we had we settled upon a design based upon a Ouija board and candle set. 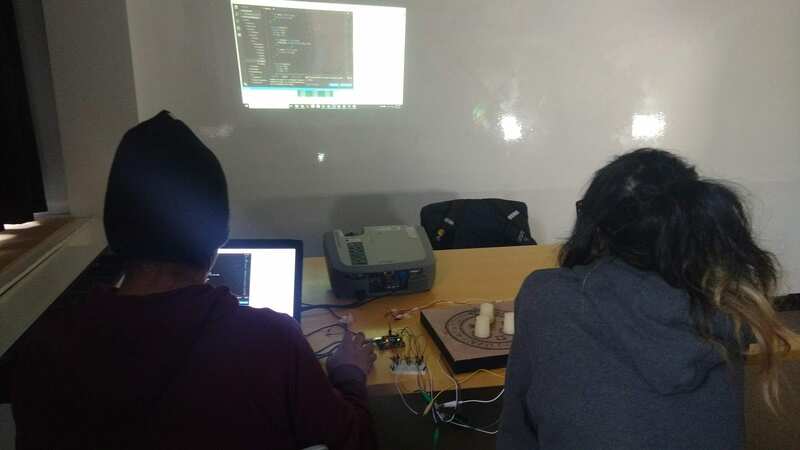 The Arduino components were a relatively simple design based upon multiple on and off switches and light sensors, these were tried and true methods that we knew would work but the trick was to utilize these components in a creative way through the building and usage of the controllers. With an idea set in stone we then researched other creative and unique controller designs throughout history as well as analyzing aspects of our past experiment as our “Cardboard Band” project was also inspired by the idea of providing an extra level of immersion through the design of the controller; utilizing what we learned we worked towards taking this experiment a step further. In our research we found many strange yet unique controllers. The article “25 bizarre video game controllers” by Aaron Birch details many unique and creative controllers throughout history, yet one of the controllers that stood out for us was the Dreamcast’s Sega Fishing Rod that featured motion sensing capabilities, a quick upward thrust mechanism, and a reel on the side in order to catch fish on screen (Birch 2014). Although on a technical aspect it might not have been too different from a standard controller it was arranged in a creative and unique manner related to the theme of the game in order to provide an extra level of immersion, intractability, and entertainment. Controllers of this nature wouldn’t find much use in other games as they are more specialized and typically can only be used in certain games; however, this type of hardware excels in a more public arcade setting as it catches attention and allows multiple people to try and play the game. 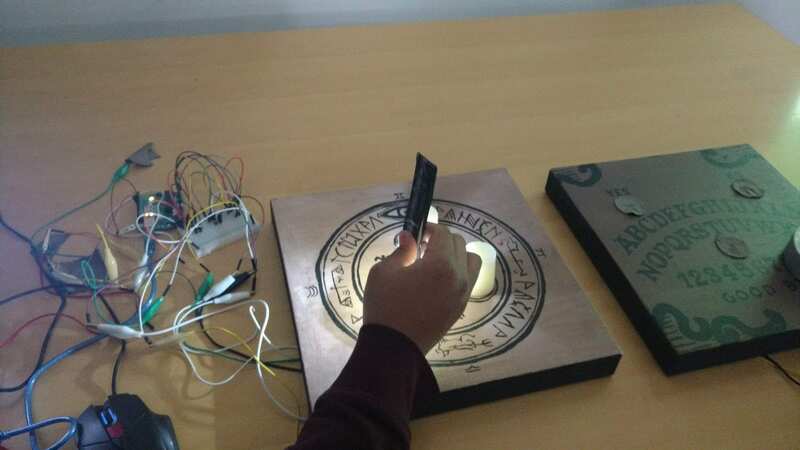 With the design of our Ouija board and candle set controllers we hoped to create an intriguing and unique design that catches attention and encourages people to investigate and try it out. The list of features we wanted our game to have is for it to be a two player game, to have the controllers represent the feel of the game, and to have the game fully functional. What worked was that the game was playable with two players so throughout the critic people enjoyed playing and competing with each other which is what we had originally wanted. 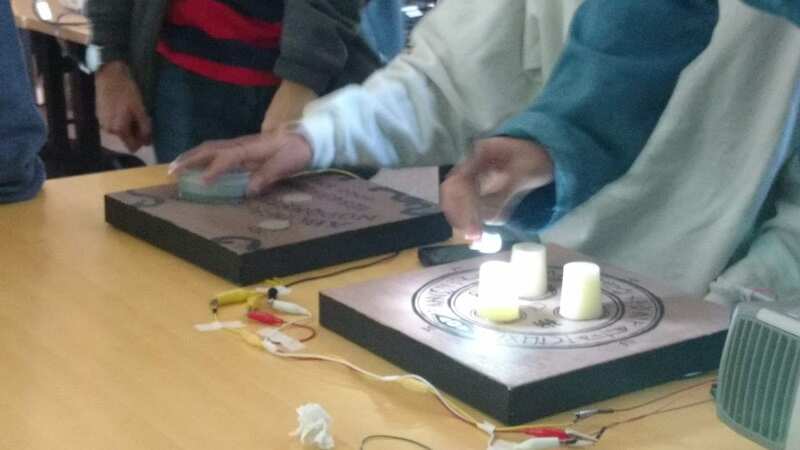 Another feature that was implemented well was the controllers; since our game involved ghosts we felt that it was appropriate to design the controllers as a Ouija board and a sort of magical circle with candles. We felt that the controllers made the person more immersed into the game. For the game being functional it did work but there were some problems with some collision detection but overall it worked as intended for the most part. For experiment 4 our goal was to simulate an arcade game with a different dimension of play moving away from traditional controllers. The gameplay would be focused around a competitive 2 player mode where Player 1 would play against Player 2 on screen. 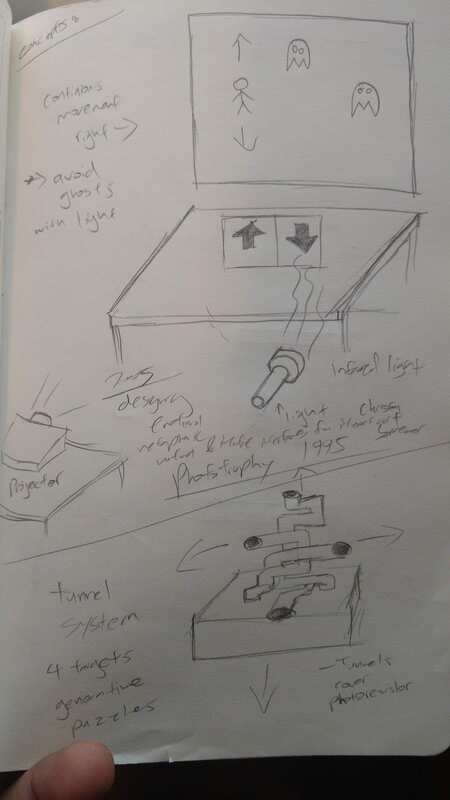 As we cycled through ideas for different types of games such as air hockey, whack a mole, and Tron Lightcycles we had contemplated and played upon a potential a concept with the game “Luigi’s haunted Mansion” wherein the player would use a flashlight to shine at a hidden photocell to make an onscreen ghost disappear. This is where we decided that our game theme would revolve around ghosts with the use of photocells. To develop this into a 2 player game like we intended it was decided we would focus our game mechanics in a comparable fashion to soccer or hockey where the goal was to score a point while another played defense. 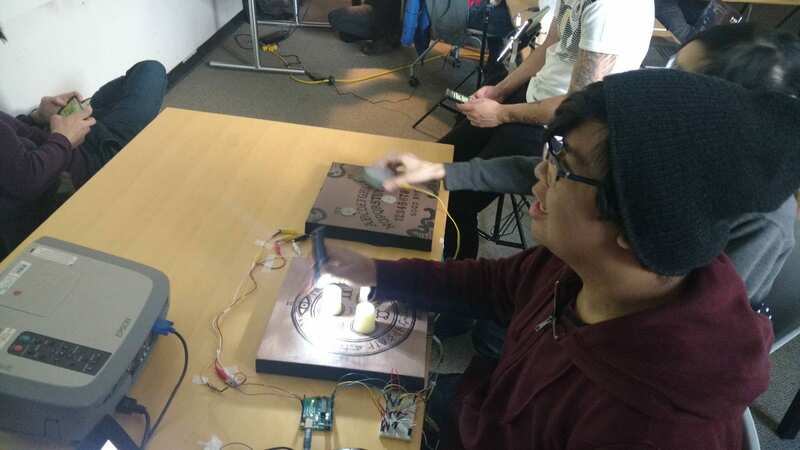 In this case Player 1 would summon a ghost with a Ouija board and touch sensors to reach the opposite side of the screen while Player 2 defended themselves by using a light source to illuminate mock candles with photocells to “banish” Player 1’s ghosts. We decided we were going to pursue this game design and theme as it allows for us to create a competitive 2 player game as well as create unique ways to interact with the game for both players. 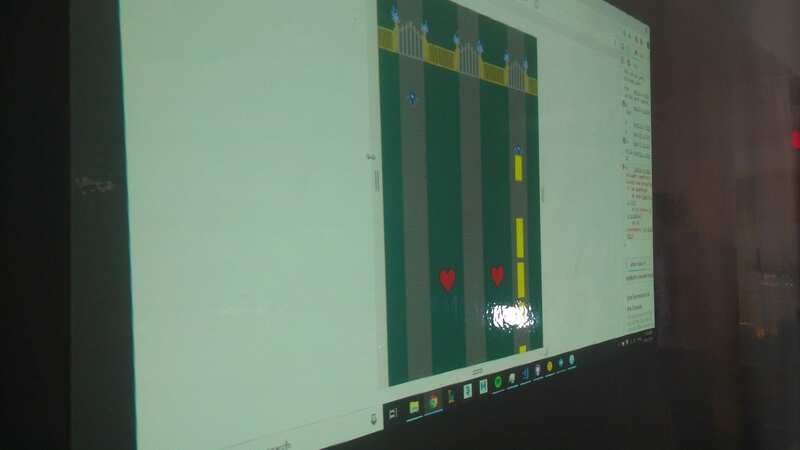 Creating a game for our final project was something of a unanimous decision; we were all gamers to some extent and we couldn’t see ourselves doing anything other than a game. As our main inspiration behind the project was the creation of a fun and physically interactive two player game we bounced around several ideas regarding old arcade games; we would then settle upon creating something akin to these games as they were relatively simple and their pixelated graphics were potentially easy to replicate and manipulate on screen using the Arduino and P5.js. 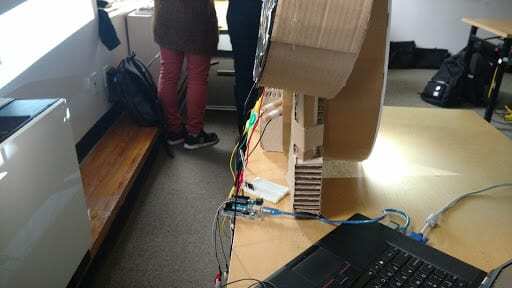 With an idea in mind we browsed through multiple examples of the Arduino being used in order to create arcade styled games. One example that stood out was Kris Temmerman’s storefront arcade game, wherein the creator utilized an Arduino DUE and a neopixel display in order to create a public arcade setup where up to two people could play a pixelated game through the storefront window (Benchoff 2013). 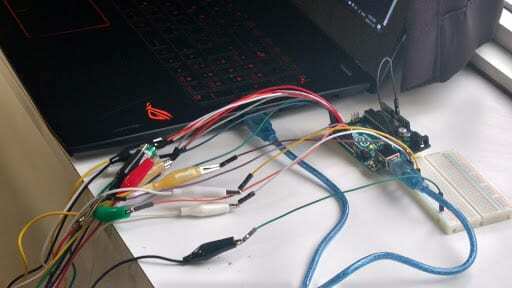 Although Temmerman’s example did not include P5.js it displayed the potential of the Arduino in terms of creating games and the controller in order to play them. 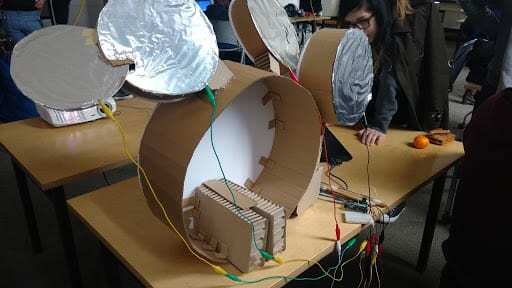 Essentially, the Arduino had the potential to create a powerful and creative controller while P5.js had the potential to take this a step further by offering fun and interactive digital visuals and sounds. A big aspect as to what influenced our final design was what we had available in terms of parts and resources for the Arduino as well as our combined skillsets and knowledge in utilizing these parts. 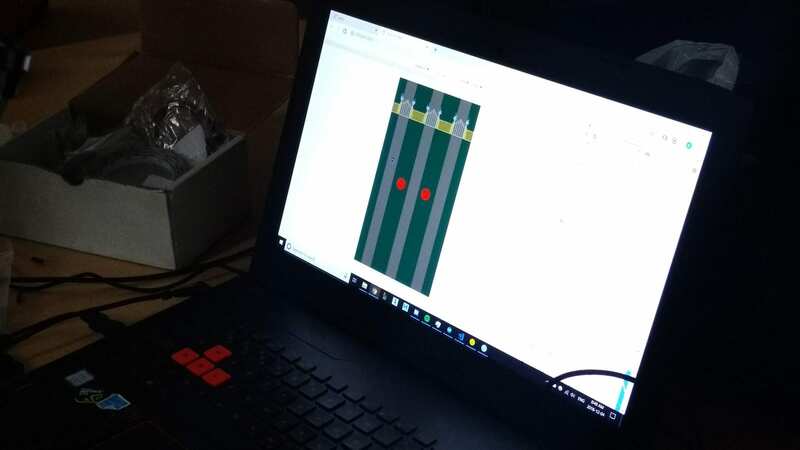 Our original designs had elements on the screen being controlled by the player’s hand movements but we found that this would be incredibly difficult using the Arduino. 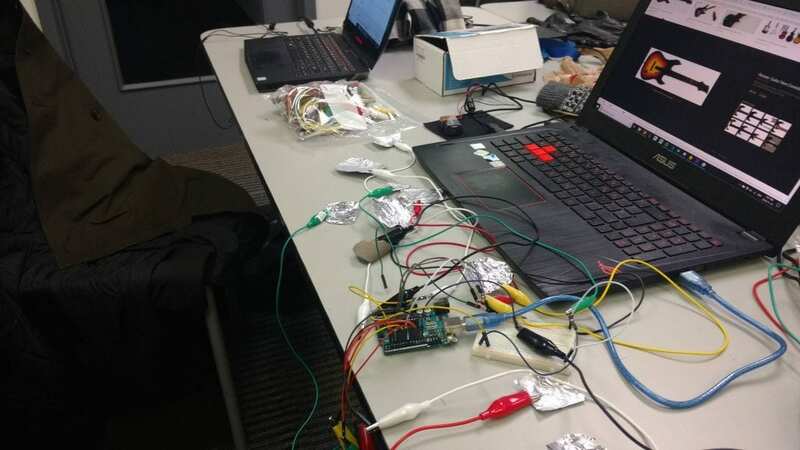 We eventually settled upon the use of analog switches as well as sensors in order to utilize what we had learned from our previous experiments as opposed to trying something new that could potentially not work and end up wasting time. However, with valuable advice and criticisms that we had received from our previous group project we hope to avoid previous pitfalls and expand upon what we have learned in a new and creative way. The concept that we decided to work upon and create was a 2-player game where the players activate their own switches using different materials. In this game one player controls a human that carries a flashlight while the other player controls the summoning the ghosts. 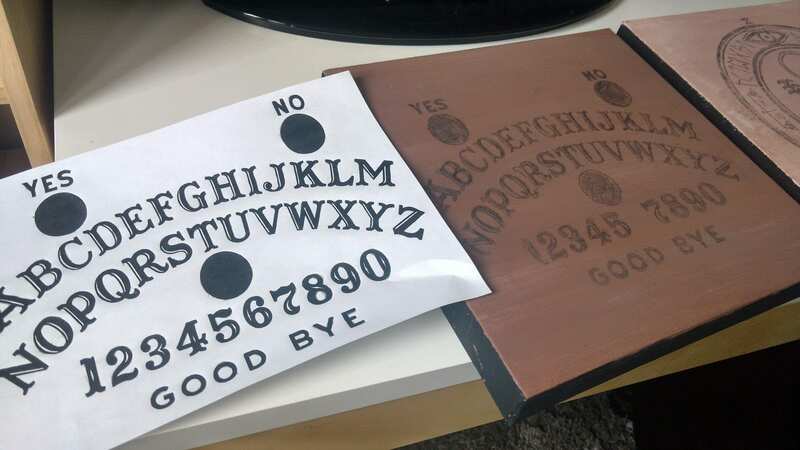 The ghosts will be summoned using a Ouija board with a switch as well as a heart shaped piece. For the other player we decided to use light sensors so it felt more realistic when the player shined their flashlight onto a spot that would be where the in-game character shines their light. 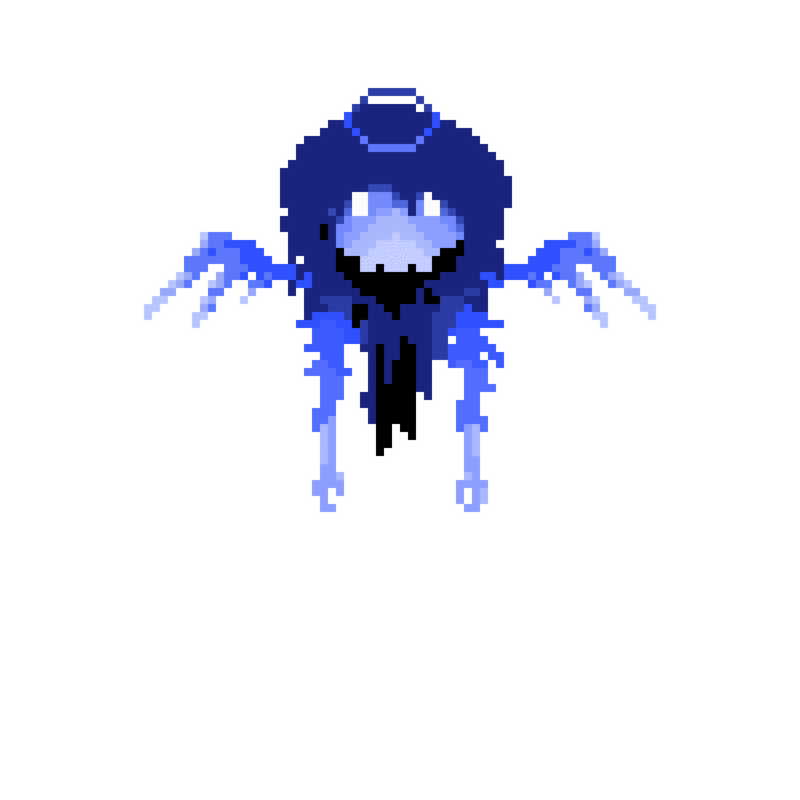 For our visuals we decided upon creating 8-bit sprites; all of this would be coded using P5.js. As for the materials we plan on using we decided upon constructing the game board with either foam or cardboard. 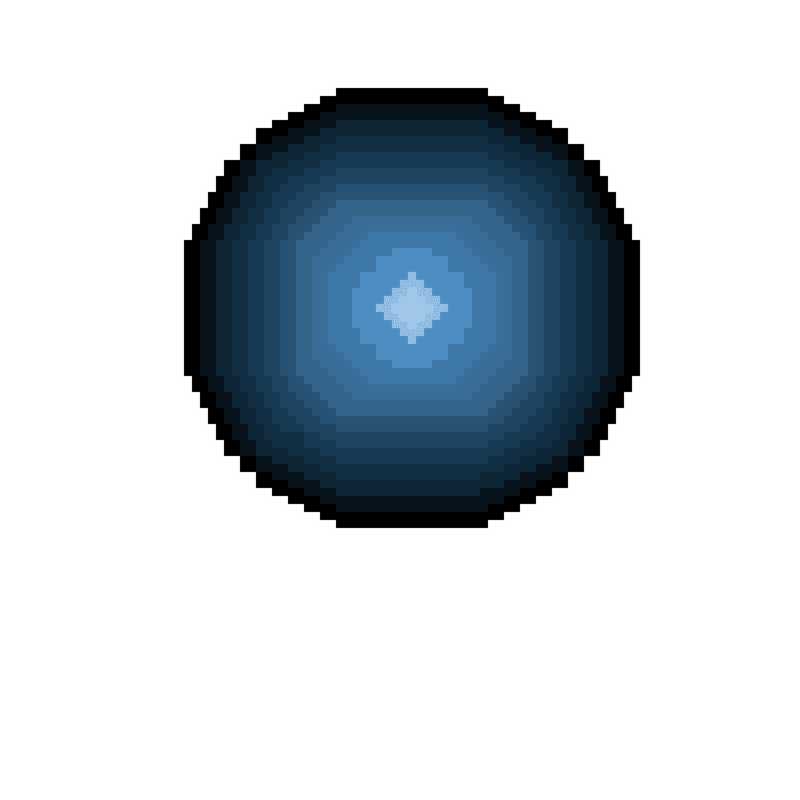 The player would have light sensors in different areas of the board that he/she would have to aim their light towards in order to stop the approaching ghosts. For the player playing the ghost he/she would have to interact with the Ouija board in order to summon the ghosts by sliding the heart shaped piece making this a digital switch and both these items would potentially utilize conductive fabric as tinfoil would break too easily if people were sliding too quickly or applying too much force. 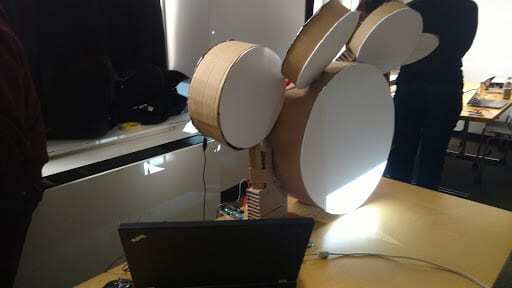 Our final prototype consists of two instruments constructed out of cardboard; a guitar and a drum set. When a specific note is played on the instrument by activation of an analog switch the corresponding sound will be played through the laptop. 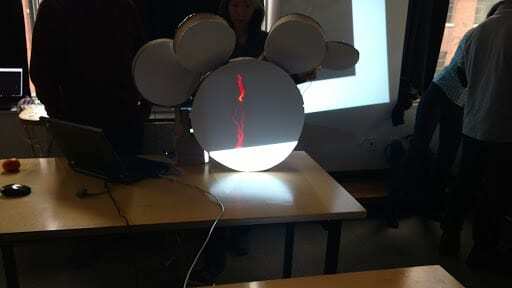 The drum kit is also connected to a projector which is aimed towards its front surface; when a note is played a red projectile travels from the top to the bottom of the screen in an erratic thunderbolt-like manner and creates a small explosion when it reaches the bottom of the screen. The projection is capable of having multiple thunderbolts on screen depending on how much notes are played on the drum kit. 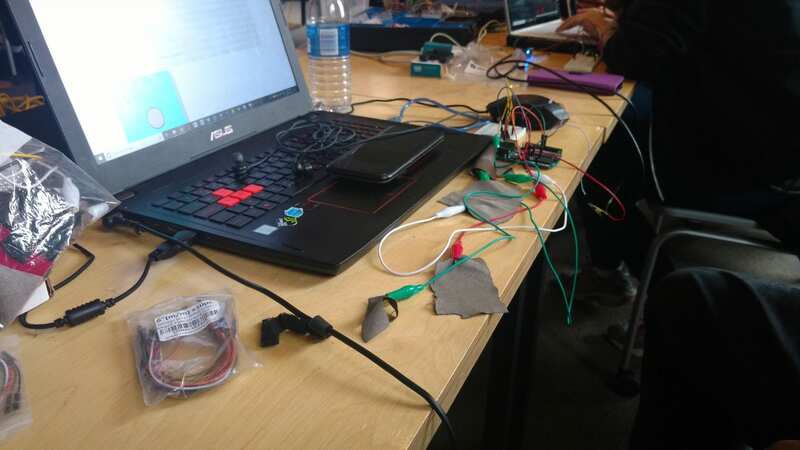 Our group used digital sensors to power all of our instruments. 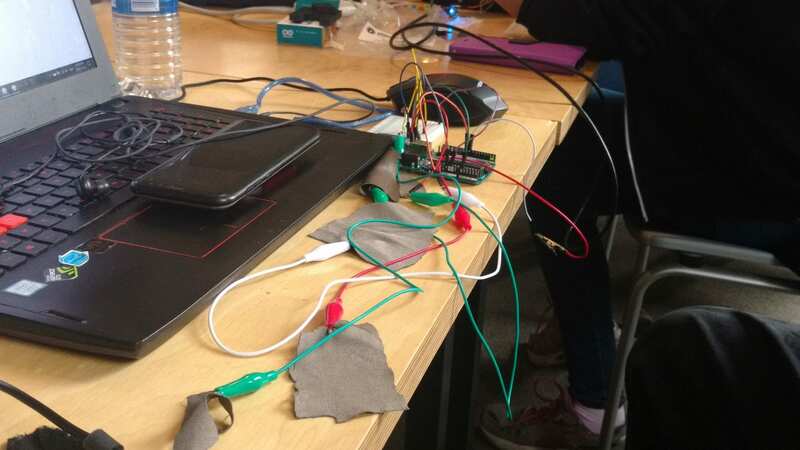 The conductive material that we used the most was aluminum foil because it was the easiest and most accessible material to use. In this diagram the green wires are connected to the strings of the guitar and the red strings are connected to the frets of the guitar. 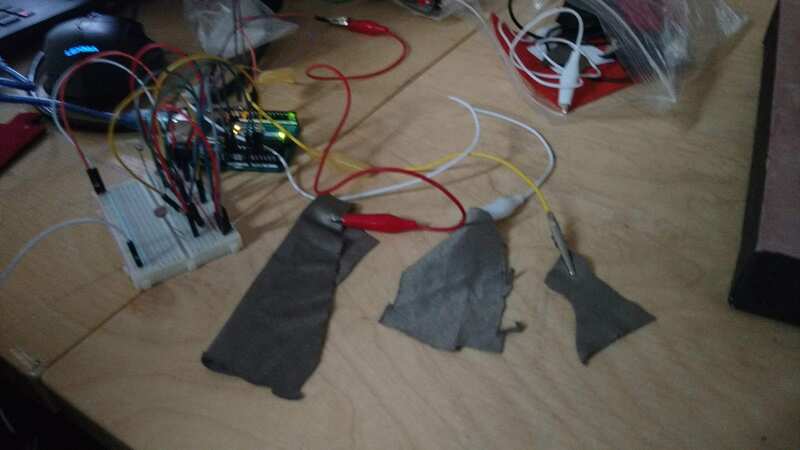 For the black wires they were connected to the conductive fabric people had on their fingers and the guitar pick. When the fingers and the frets connect it doesn’t create a sound for the guitar but instead makes it so when the pick and the strings connect it creates a sound depending on which fret is being held down. In this diagram the red wires are connected to the parts of the drum and the black wires is connected to the drum sticks as well as one part of the kick drum pedal. When the sticks hit any of the spots on the drum it creates a sound of the drum kit depending on where they hit. 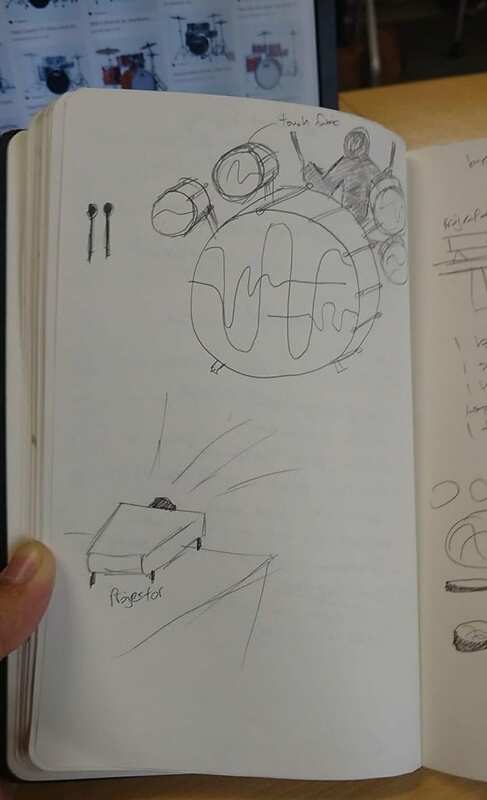 Original concept sketch for electric drum kit setup. Original concept was to create a flat slate with foil pads, but it was decided to expand the design to simulate actual instruments to provide a more immersive experience. 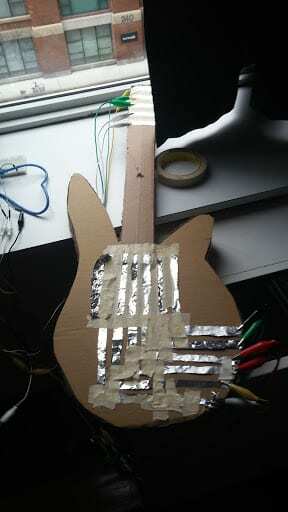 Construction and testing for the electric guitar arduino components. 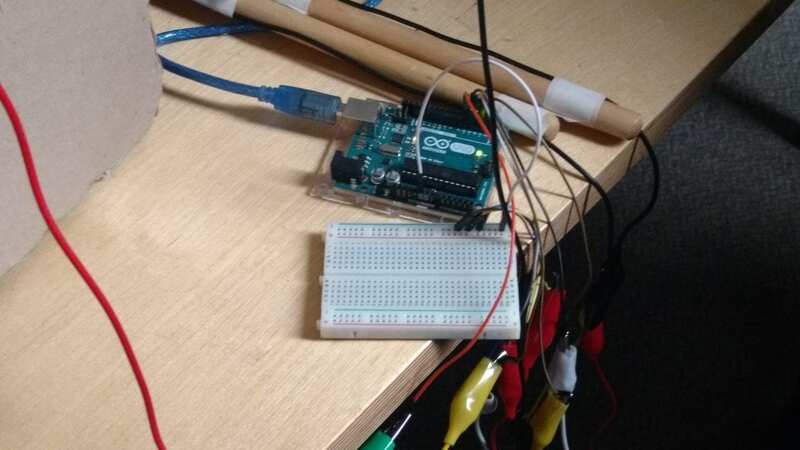 Arduino components for electric drum kit. 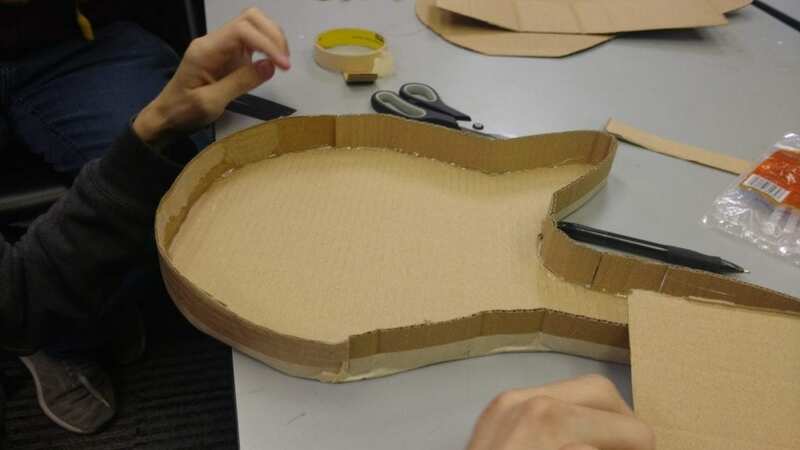 Cardboard electric guitar body construction. 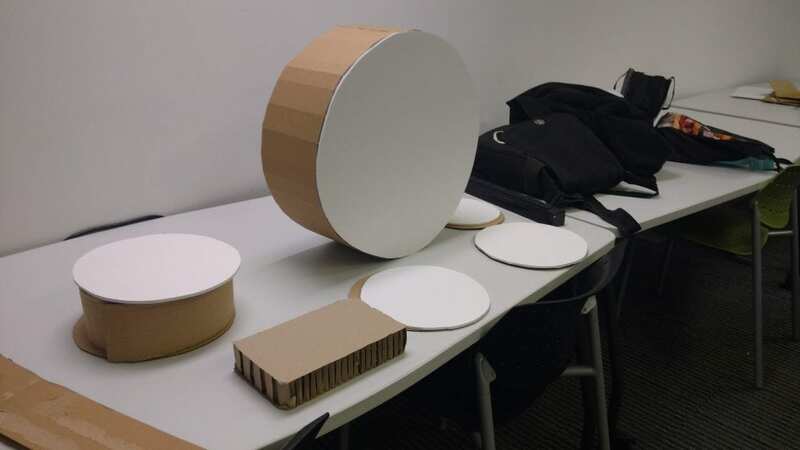 Construction process for cardboard electric drum kit. The context and inspiration behind our project was to create a virtual band setup akin to the well-known video game franchise known as Guitar Hero. The game was and popular and beloved franchise which begun in 2005 wherein the player would use a guitar shaped controller to play along to a list of popular songs as if they were part of a rock band; the formula proved to be a success with earnings reaching one billion dollars within the first week of its premiere (Venard n.d). 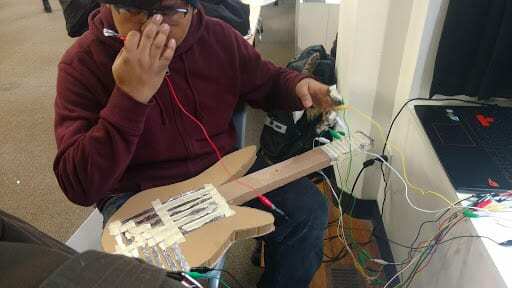 For our final prototype we wanted to create something akin to the virtual band as represented in Guitar Hero; our first prototypes revolved around analog sensors or switches that could either be placed on the table or wall but we decided to place them onto appropriate instruments made out of cardboard in order to give the user a better sense of immersion and top make the experience more entertaining. 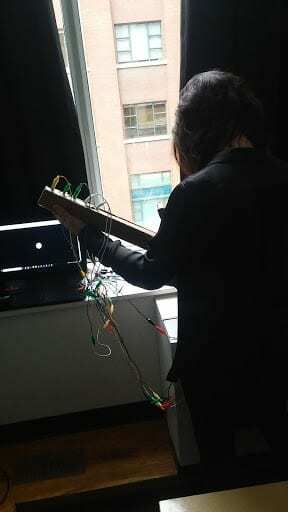 Our prototype differs from Guitar Hero in that instead playing predetermined notes on the screen we gave the user more freedom by allowing them to play any note they want and an appropriate sound will always be played; our prototype offers a more freestyle and creative experience. 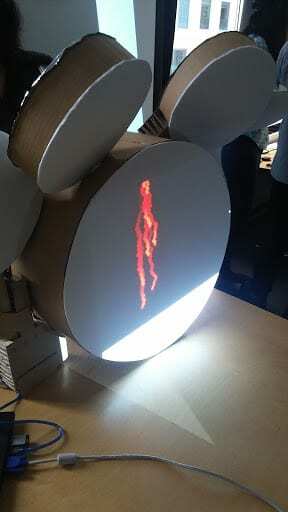 We had also hoped that the interactive visual would also encourage the user to play the drum kit more while also offering an entertaining experience for people watching the user. For my Final Prototype I chose to create an 8-bit styled interactive game based upon the 1985 horizontal scrolling shooter Gradius by Konami. The project consists of a jet locked at a fixed y coordinate that the user is able to move using the left and right arrow keys. When the up arrow is pressed a projectile is launched from the center of the jet that travels to the top of the screen. 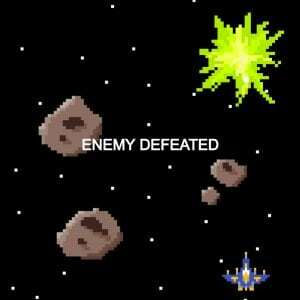 When hit by a bullet, the enemy ship at the top of the screen will disappear in an explosion while a complementary victory alert flashes onto the screen. 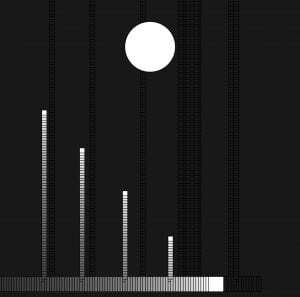 I chose to create a game as an exploratory experiment towards my main interest in regards to learning programming. Video games are one of my life’s passions and it is something that I hadn’t attempted to create before yet it was always something that I always wanted to attempt. When I considered appropriate projects for those relatively new and inexperienced with programming many examples popped to mind but the retro 8 bit world of gaming had seemed like the best option; the games were relatively faced paced yet simple and the 8 bit graphics weren’t too difficult to create. The main inspiration for my project is Konami’s Gradius, a retro arcade game that I had always had a soft spot for. Gradius is a side scrolling shooter where the player navigates a jet through dangerous environments in space while dealing with hostile aliens and creatures. I chose this particular format because when thinking of the format of this particular style of game through code it was something very doable with p5.js; the bullets and enemies could be tracked by arrays while the ship could be moved around with the arrow keys. Arcade games are something with a relative simplicity wherein the player is able to pick up the game and quickly understand how the game works and how to play it (Fox, 9). The simplicity of retro games was something that I could tackle with my relatively low experience and it would be a great first step into a possible future gateway of more complex experimentation on a large and more grandiose scale. Fox, Robert. “Space Invaders Revisited”. Communications of the ACM, Volume 41, Issue 7. 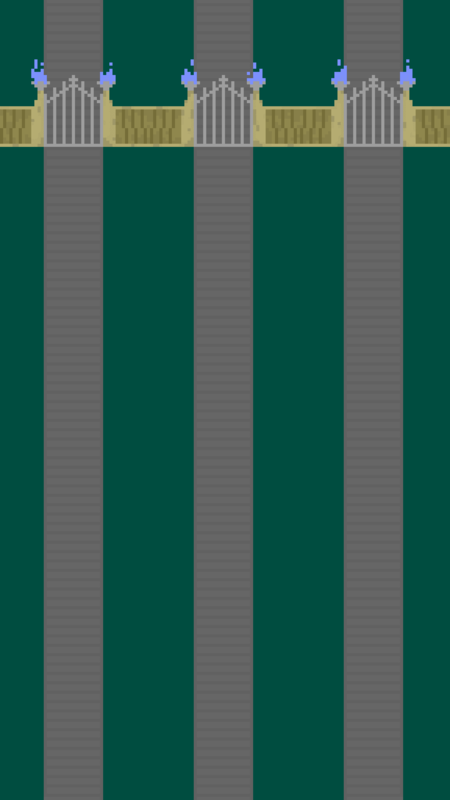 ACM Inc. (1998). Pg. 9. Web. Kalata, Kurt. “The History of Gradius: A look back at 30 years of Konami shooting” Gamasutra. UBM (2015). Web. Author Joseph EilesPosted on September 27, 2018 1 Comment on Hello world!